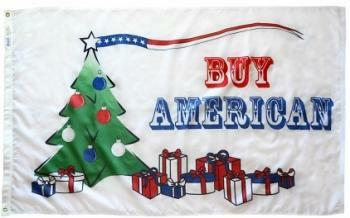 3x5' Nylon Buy American Holiday flag. The image is dyed onto 200d nylon heavy-duty, durable outdoor flag fabric and is finished with canvas header and brass grommets. Made in the USA. The Buy American holiday flag is designed for retailers who feature Made in the USA products as well as manufacturers who source and make their products in the USA. The flag features a red, white and blue themed Christmas with decorated Christmas tree, presents and a patriotic pennant atop the tree.